A Taste of History with Joyce White: Fried Corn: Buttery and Delicious! Fried Corn: Buttery and Delicious! This recipe is from a collection of recipes found in a manuscript journal located in the H. Furlong Baldwin Library at the Maryland Historical Society in Baltimore. The manuscript is attributed to Ann Maria Morris and the date of 1824 is written on the inside cover. The recipe below is one of many from the manuscript that will be included in a book I am writing. The book will contain biographical information about Mrs. Morris, an annotated transcript of the entire manuscript as it was written, and a section of modern recipe adaptations. I really like this recipe because it reflects that this manuscript was written in Maryland, a colony/state that was dependent upon Indian corn (maize) from the time of settlement in the 1630s until the late 18th century and beyond. Of course, the history of corn in the Americas reaches much farther back than the 17th century. Below are some highlights as it relates to what was needed for this recipe - sweet corn. 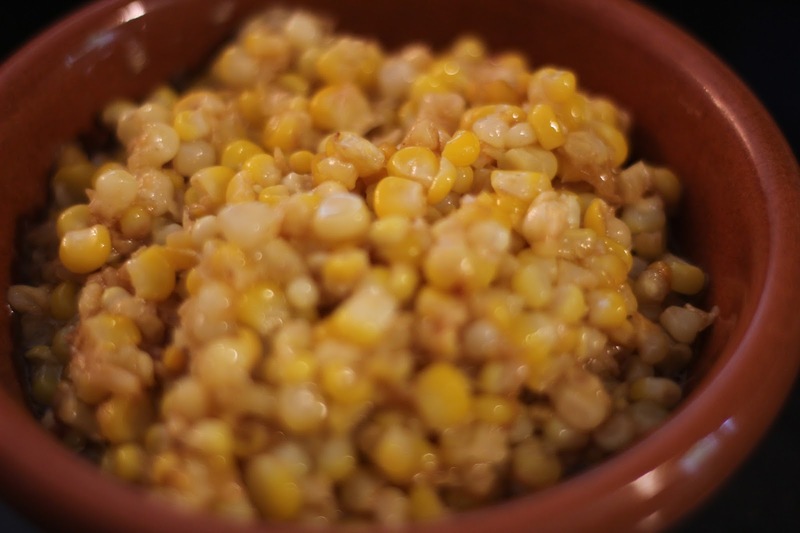 This recipe requires a type of corn that is sweet and tender enough to be consumed as a grain. Today, this is not really a big deal because sourcing tender, juicy and sweet corn is easily done. The history of corn, however, proves that this was not always the case. Corn has a very long and complex history. Below are some highlights to help you understand the place of sweet corn in American history. However, the history of corn is much more involved and complex than what I have described here. See below for sources to check out to find out more about this very American grain. Corn, also known as of Zea mays, was first domesticated from a wild grass known as teosinte which is native to central and southern Mexico, and Central America. Evidence of ancient corn cobs found in caves in Mexico proves that domesticated corn goes as far back as over 6200 years ago. There are several types of corn and they are classified as follows: dent corn, flint corn, flour corn, popcorn, sweet corn, waxy corn, and pod corn. The most popular type of corn grown in the United States has traditionally been dent corn, though flint corn was also grown. These types of field corns have tough seed coats and because they were allowed to fully mature in the fields, their natural sugars had lots of time to convert into starch. This type of corn grown by settlers was not tender enough to eat off the cob as a grain when fully mature. As a result, dent corn was mostly processed into the hominy and/or grits that played such a huge role in the diet of many Marylanders, both enslaved and free, who worked the land by farming the incredibly labor intensive cash crop, tobacco. Field types of corn such as dent could also be picked when they were "green", or young, and therefore immature enough to still contain inherent natural sugars not yet converted into starch. This corn would have been sweeter and more tender than when fully mature and therefore could be eaten as a grain. How often this was done by European settler is hard to know for sure. There are other types of corn that are genetically more sweet than the field varieties in their green stage. Varieties of sweet corn that are naturally sweet evolved as a genetic mutation which causes the kernels to accumulate about two times the amount of sugar than field corn. These types of corn are the result of naturally occurring recessive mutations in the genes controlling the conversion of sugar to starch in the endosperm of the corn kernels. Therefore, these types of corn strains were genetically ideal to be picked when young or green to be eaten as a grain. While these naturally sweet strains were not really popular in the US before the 19th century, several Native American tribes had been growing sweet varieties of corn. Chullpi from Peru or Papoon from Mexico were the two most significant types of naturally occurring sweet corn. Papoon definitely made its way from Mexico to as far as the northeastern portion of North America and was acquired by the settlers from the Iroquois Indians in 1779. Because settlers weren't really exposed to sweet corn until the late 18th century, it is no surprise then that sweet varieties of corn did not became more popular in North America until the 19th century, when planters started experimenting with them and crossing them with other varieties, making the grain even sweeter and more tender than ever before. Interestingly, it was the 19th century invention of the canning process that sparked the desire to develop even sweeter strains of sweet corn so that the taste of sweet fresh corn on the cob could be captured in a can for year-round enjoyment. Interestingly, modern varieties of sweet corn are bred to be as sweet as possible, containing three to four times more sugar than their field counterparts. Strip and rasp twelve ears of corn avoiding the husk, it will yield one pint & ¾ have a pan or skillet heated and melt half pound of butter in it. Stir in the corn & season it with ground pepper and salt – if it be too thick, add 3 tablespoonfuls of new milk-stir it all the time it is being cooked, and form it for the table. 1. Scrape the kernels of corn off of the cobs. 2. In a large frying pan or Dutch oven, melt the butter over medium-high heat. Add the corn to the butter, season with salt and pepper, and fry for about five minutes. Reduce the heat to medium-low and cook for another five minutes. 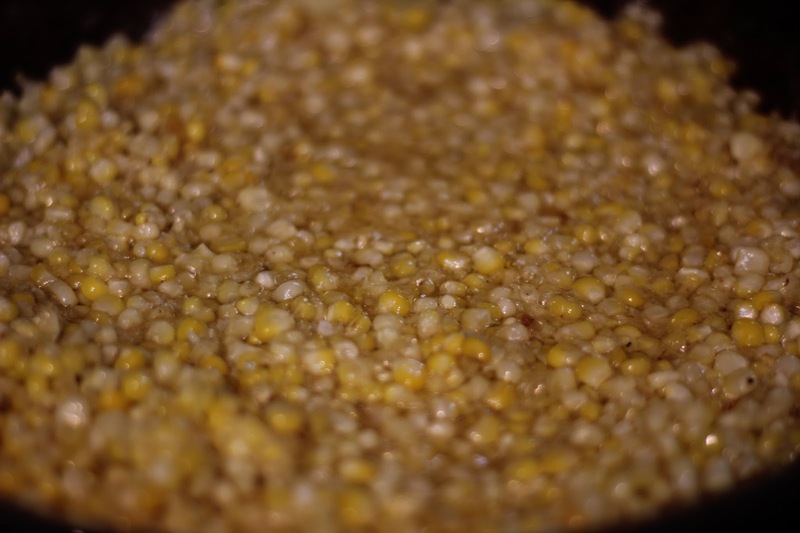 Stir frequently so that the corn starts to brown evenly. 3. Add the milk or cream and cook on low for another five minutes over very low heat.